Nope this is not some voodoo magic, or something someone made up to make parents with fussy children feel like failures. It is real and TOTALLY works! Truthfully it is the same as normal sleep training, aka the cry-it-out method, but with a different mindset. About a month ago I had hit my limit of sleepless nights, and long sessions of rocking Cooper to sleep for naps. I started looking into this so-called sleep training and got depressed. How was I going to just let him cry it out?? I tried it a little bit but hated it. 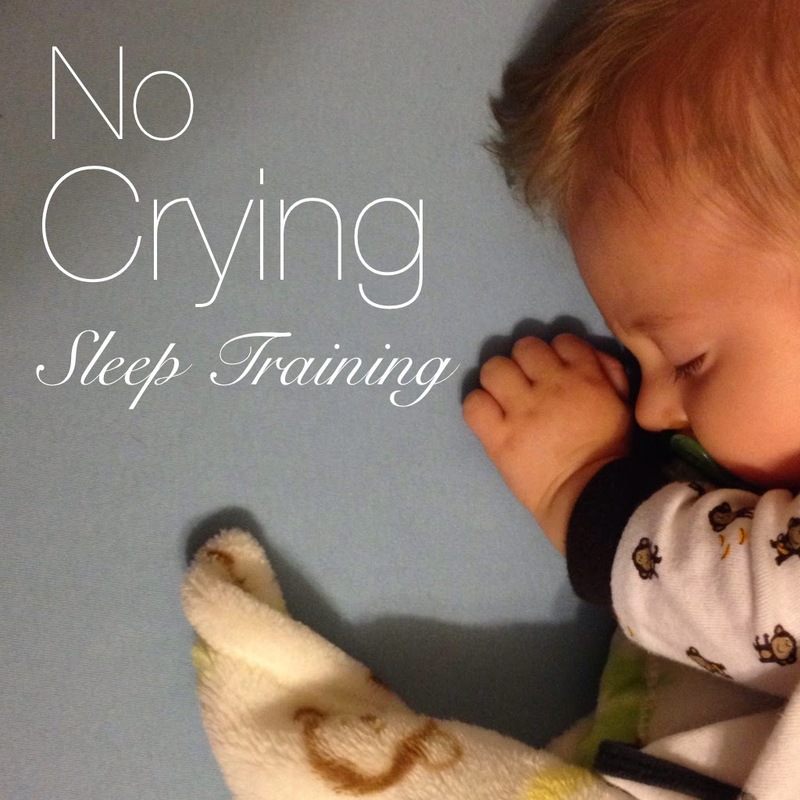 Finally I googled “no crying sleep training” thinking nothing would come up, but low and behold there is a “method” and it worked for me so give it a try! The concept is simple: Teach your baby that you will come to him when he is calm, not when he is crying. When your baby is getting sleepy, rock or read to him (or do something to help him relax), then put him in his crib. Assure him that he’s a good baby and tell him it’s time to go night night. Then leave the room. BUT try to come back in before he starts crying. Enter the room, rub his back (or something soothing), tell him he’s a good baby and that it’s time to go night night. Leave and repeat. When your baby starts crying, because he probably will the first time trying this, wait until he’s having a calmish moment to go back in and do the same thing. **IMPORTANT** Show that you are confused that he is crying, but NOT afraid. Babies understand more about emotion than you think. If you stay calm, he will know to be calm. I kind of thought it was a little crazy at first. How will my baby know I’m not afraid? Can he really “learn” that I am coming in when he is calm, not when he’s crying? After trying this though, I truthfully do believe he could sense that I wasn’t afraid, because why else would we even try to calm a crying baby in the first place? If we didn’t believe they wouldn’t be soothed by us, then wouldn’t we just always let them cry? A baby is constantly learning what to be afraid of and what not to be. Why not teach him that feeling tired is something not to be afraid of. Day 1: I did exactly as I described before. rocked, read, and left the room. I came back in before the crying, calmed him, and watched as he drifted into a dreamful sleep. Jk. He cried after the third time going in… So then I almost panicked, but didn’t. I watched the clock like a crazy woman wondering how long it was possible for a mom to listen to her baby cry without going insane. Finally he had a moment of calm, (aka he finally took a second to breath), and I rushed in. I tried to calm him but he was still crying, so I caved and picked him up and rocked him for a second. He immediately fell asleep. I kissed him a million times and put him to bed. This pattern continued that day throughout his naps. Bedtime though, he just sort of fell asleep right away. Day 2: Success from the first try. He fell asleep after I entered his room twice on the first nap, and I sort of forgot to even go in on his second nap. Day 3: Same thing, AND I didn’t have to feed him to get him back to sleep at his 2 am waking. He was still drowsy but fussing a bit so I just stuck his binky back in and he fell asleep. For two weeks it worked perfectly! Honestly, I had no issues as long as he was getting sleepy when I rocked him and laid him down. All I had to do at 2 am also was stick his binky in. A few times though he didn’t even wake up and I SLEPT THROUGH THE NIGHT. But…. then the reality of being a Mom hit and he got suuuper sick for two weeks and sleep and no crying was a long lost dream. He is finally better now though and I re-did the training yesterday with much less crying and success by nap three. ** UPDATE ** with baby number 2! My second baby Haden is only 4 months old but I’ve already started using this method and I can definitely tell that it is making a huge difference. He has always been a pretty good nighttime sleeper, but naps were short and hard to come by. I started to think maybe it was a good time to sleep train so I’ve implemented this method, as well as focused on putting him down for a nap every 90 minutes from the last time he woke up. (think play, sleep, eat.) Now for the most part, I can just set him in his crib after reading a story and he’ll wiggle himself to sleep! I think that because I am calm around nap time, he is calmer. Try it!!! If anything, trying this will at least make you feel like you’re not just sticking your baby in a cage and letting him cry. Good luck!! The timing for this is perfect with one of my reader posts. She would love advice on this subject if you don't mind sharing your link with her. Hi. I would like to try this method out in there 6 month old. We never wanted to co sleep but ended up doing it because he wouldn’t sleep in the crib or bassinet. Now that he’s 6 months we really need to try. If I put him down after rocking and nursing to where he is drowsy he will start screaming. Do you leave the room now or try comforting? He only comforts when I pick him up. Cries as soon as I put him down. Should I continue to do that until he calms down? Please help don’t want to CIO. He screams until he chokes. Hi! That sounds so rough. It is so hard to hear them cry like that! From my experience I definitely think you should comfort him if he starts screaming right when you put him down. You don’t want him to hate going to sleep. If it were me I would put him in his crib drowsy and if he starts screaming, try patting and giving him his binky, and shushing. If that helps, even just a little, then quickly leave the room for about ten seconds (or longer if he’s still calming down) and then go back in if he’s still crying bloody murder. Pick him up and calm him back down to a drowsy state and do the same thing again. I don’t think it’s bad at all to pick your baby up and comfort him as long as you keep trying to teach him that he’ll be okay on his own. It’s hard to keep doing it over and over when it seems like you’re not making any progress but it really is possible. Since he was co-sleeping and perhaps super attached to you, you could try putting one of your shirts you’ve recently worn in with him. My first son loved this when he was getting babysat. Another thing that helped changed my mindset about sleep training is realizing that the “bedtime/naptime routine” doesn’t need to be something that makes them drowsy, but is just something that is easy to consistantly do that they enjoy so that they are happy to go to sleep. My best advice is to just be patient and consistent (I know, you’re favorite thing to hear right?) and focus more on making sleep fun and happy for him than scary. When you go in to comfort him give him lots of kisses and hugs vs being frustrated and angry. (easier said than done…) I promise you will get sleep again!!! You can do this! We have actually done something very similar with both our girls, they do understand much more than what we think and learn what to do or not to do. It's great the way you have say it and awesome that you are sharing this with everyone. Thanks! What exactly did you do? I'd be interested to hear! Thank you for linking up with us. I have never heard of this method but it seems like it would work. I agree that babies can feel our emotions way more then we give them credit for. I found you through the HDYDI link up this week. My youngest is currently going through a rough period of getting to sleep. She doesn't want to be held or left in the crib to go to sleep. It takes a long time to finally get her down. I will try this and see if it works! Sleep-training is practical, purposeful, and a marvelous way to keep your sanity in the long term. Using a cry or no-cry method, I think the positive effects of better sleep for both young baby and parents are endless. And I think the earlier sleep training is started, the fewer tears involved. With younger babies, even methods using some crying don't involve all that much crying if parents are consistent. Thanks for sharing your experience!! Interesting. I've always wondered what this "no cry" method really looked like. Makes some sense. Whatever you do to get baby and mom sleeping more is usually good… assuming it's legal. hahah. At 12 months, I think my kids are old enough to learn how to go to sleep on their own. But we have always coslept, so I don't have a crib to leave them in. If I place them on the bed, they'll just get up and come into the living room or just rummage around the bedroom looking for trouble, little imps that they are. Do you have any tips for cosleeping parents? I linked over from hdydi.com btw. Thanks for sharing this! Have a wonderful week! How old is our little one? I need to try this for mine. Some nights she's great, others she wants to get up and nurse in the middle of the night. I'll have to give it a try and get back to you. Thanks for sharing. This is great! I use the same kind of training methods on my horses. Don't laugh. Horses are like human babies. It's called positive reinforcement. I'm not laughing, I think that it's amazing! It's always wonderful when what we do accomplishes the good in things! Thanks for sharing this. Not being a mom and my experience with crying babies on a day in, day out bais, I greatly admire moms, especially with babies. Best wishes to you. Hey Brittany! Somehow I missed this comment! I hope you got things figured out! Honestly I don't think there is a perfect answer to your question. My baby's naps vary in length all the time although they do follow somewhat of a pattern. If he cuts his nap short I usually try to put him back to sleep if he seems sleepy. If he doesn't I let him be awake and hope for a longer nap on the next one!! Hi there! At what age can you start using this medthod? At about 3-4 months your baby should start getting into a napping pattern. I might wait a little longer before you start sleep training but you can start by putting your baby down drowsy instead of fast asleep. Good luck! How long did you wait until you come in ? How old is your baby ? My baby boy takes catnap during the day only after he fall asleep in my arms. Every time I put him down, he sleep for about 10-15 minutes. I want to try your method but I cannot see he cry too long. If he seems old enough to be developing a sort of regular nap schedule I would try it. Every kid is different though. Another thing that helped me with his sleep is paying attention to his "tired cues". He would start scratching his nose and tugging at his ears when he started to get tired, way before he rubbed his eyes or cried. If I started rocking him and put him down when he was doing those things, it went much better then if I waited until he was rubbing his eyes. I hope that helps! It's so hard sometimes but if this is your first baby, I PROMISE you will get sleep again!! I thought I would lose my mind but you learn to cope, and once they sleep through the night you'll forget that you were ever sleep deprived. Good luck!! Okay I'm trying this with my son… He's 8 months old and getting him to sleep in the crib or pack n' play has been a struggle. Ideally, he will share a room with his big brother (who is almost 3) but I'm scared to have baby stay in the room now and wake his older brother who DOES sleep through the night! Thank you for this idea! I have no peace at all about making him just cry it out and after much prayer, I know God is leading us in another direction. I am so glad you shared these wonderful tips for No Crying Sleep Training with us at the Plant-Based Potluck Party. I’m pinning and sharing. Very helpful advice! Thank you for sharing at the Healthy, Happy, Green and Natural Party Blog Hop. I’m Pinning and sharing! When I needed help with sleeping problems I’ve read about Susan Urban’s guide and her the Hold With Love method. I gave it a try and today we are much happier parents. My son is the best but when it came to start sleeping in the crib he was pretty hard case. After 4 days of the HWL he was able to fall asleep on his own in his crib without crying and he finally stopped waking up every hour to eat. I’ve heard about this method but I didn’t use it on my own yet because I am pregnant. My two friends did the hwl and they were very happy with the results. I have just used Susan Urban’s method to stop bed-sharing. It worked so smoothly I was really surprised and very proud of my little princess! I wanted to say that I also decided to try “How to teach a baby to falll asleep alone” ebook and I’m happy to report it has worked for us. Thank you so much for sharing your experience girls. All the guides for parents should look like “how to teach a baby to fall asleep alone” written by S. Urban – short! clear instructions! Without unnecessary information, not even 20 pages and after reading I knew what, when and how! The method has worked just great so I am very happy with what we have achieved! You say this Susan Urban guide is good? I’ve just found it as I’ve been searching for no-crying methods. I am about to start it soon, just preparing out before bedtime routine. It’s the best! I just used this for my second child and it worked even faster this time (probably I was better prepared for the training that’s why). Anyway – hope it worked for you too! I really liked this step-by-step structure of this book. Clear and easy to follow. 10/10 for Susan! Thank you for sharing the link. I purchased the guide and after only 2 days it helped me and my son to deal with sleep training! which two? I was also very satisfied with how to teach a baby to fall asleep alone. and now I’m thinking about buying the food guide. do you have it?